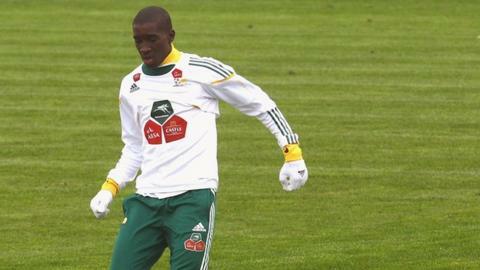 Having finally achieved his dream of joining a European club, South African defender Siyanda Xulu has set his sights on securing a place in the Bafana Bafana squad for the 2013 African Nations Cup. The 20-year-old centre-back, who had trials at Arsenal and Barcelona as a teenager and also saw a move to Atletico Madrid fall through last year, joined Russian side FC Rostov from Mamelodi Sundowns for £500,000 in September, signing a four-year deal. He made his debut last week in a 3-1 Cup victory but faces competition from Nigerian veteran Isaac Okoronkwo and Benoit Angwa of Ivory Coast to become a first choice in central defence. The situation is virtually identical for Xulu on the international scene. He earned his first cap earlier this year against Gabon and wants to catch the eye of new Bafana coach Gordon Igesund in the build-up to next year's continental showpiece. "That's my main goal. Obviously it's the Cup of Nations in January and it would mean a lot to me to be in the squad," he told BBC Sport. "I've not heard anything from the new coach but I'm sure something will come up if I can prove I can make it in Europe. I know that first I have to be playing regularly for Rostov to earn my place in the Bafana squad. "There is also a lot of competition in my position but I'm confident in my own abilities and believe I am good enough to play for South Africa again." KwaZulu-Natal-born Xulu has been rated one of South Africa's hottest prospects since he made his Premier Soccer League debut at the age of just 17. He was named Young Player of the Year in his debut season and spent two weeks on trial at Barcelona in May 2010, before completing a similar stint at Arsenal later that year. Sundowns turned down a loan offer from Atletico Madrid last season and had threatened to pull the plug on his move to Russia after negotiations over the transfer fee. So Xulu was relieved when the deal eventually went through hours before the transfer window closed. "I felt that it was the right time to leave South Africa," he said. "Football can be cruel sometimes and it's important to take your opportunities when they come up. It was a great experience for a young player like me to play in England and Spain on trial. "Arsenal and Barcelona are both massive clubs so I learned a lot and appreciated the opportunity. Hopefully in the near future I can go back to that level." Rostov also signed David Bentley on loan from Tottenham and ex-Liverpool striker Florent Sinama-Pongolle, meaning Xulu can communicate with some of his new team-mates in English. But he admitted it is crucial to learn the language as quickly as possible to allow him to settle in. "Slowly but surely I am trying because I think it is really important for me. I've started taking classes already and one of my close friends in the team has been patiently teaching me Russian," he said. "It's very difficult but if you are willing to learn then it is possible."